When we talk about Inbound Marketing, it is very important to understand what does it refer to? 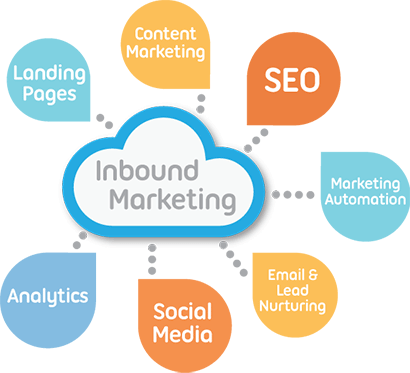 Inbound marketing is promoting a company through blogs, podcasts, video, eBooks, E-newsletters, White-Papers, SEO, Social Media Marketing and other forms of content marketing which serve to attract customers. Inbound marketing refers to marketing activities that bring visitors in, rather than marketers having to go out to get prospects’ attention. Inbound marketing earns the attention of customers, makes the company easy to be found and draws customers to the website by producing interesting content. Inbound marketing methodologies are used to reach potential customers at various levels of brand awareness. These tactics require a commitment in order to steer marketing efforts into increased opportunities, as it provides the prospect to both, learn about potential customers and have potential customers learn about the business. Since the last decade, inbound marketing has picked up pace & has turned out to be one of the most effective marketing method for doing business online. The old outbound marketing methods of buying ads, buying email lists and praying for leads, inbound marketing focuses on creating quality content that pulls people towards a company and product. By aligning the content you publish with your customer’s interests, you naturally attract inbound traffic that you can then convert, close and delight over time. To use any marketing technique one needs a target or a goal that would motivate them to work towards achieving it. After deciding on the goal, the next most important thing is strategy. It’s a simple term but is deeply useful & is of utmost importance. After we are done with determining our goals & strategies, we should get onto the plan of action. Sometimes, one tends to make the unforgivable sin of presuming that their website is a one-stop-marketing shop. What they forget is that their presence on the web goes beyond their company’s website. The need of the moment is to link your personal social accounts to link back to your business site to begin marketing yourself in a less conventional way. It helps drive traffic from a wider variety of touch points and increases the potential audience you can reach. P.S.- Make sure that the “About” sections of sites like Twitter, Facebook, Pinterest and LinkedIn have a crisp pitch about who you are, what you do and why someone should use your company. And if it suits your business, don’t be afraid to inject some personality into it. In today’s time, writing & maintaining blogs to promote your business is important. Blogging does take a lot of time, but there are many benefits of good content. Apart from helping to establish you as an expert in your field, it also helps to increase your website’s rank for main keyword phrases. When thinking about a topic for your blog, think what your potential clients will search for when they want to hire someone like you. Creating content that has a questionnaire format where you answer the questions that prospective clients have, would lead to them landing on your site and in turn will be able to read how much you are well-versed with your your area of expertise. Make sure that you integrate your blog with your website to make clients aware about the value-added content and the services you provide. There are websites that accept guest posts written by people who are experts in their respective fields. Find blogs which has your ideal audience, and contribute the timely or occasional write-ups to establish yourself as a thought leader and help generate business leads. It’s great when you can create amazing blogs from the trending topics. Content that has the right quality and edge is always preferred. It’s important to make it known when work is yours cause no one else will step in your shoes to do it for you. People who wish to hire or explore new companies are always searching for companies that are doing exceptional work. Publishing a running record of your work is one of the best ways to demonstrate what you can offer to the potent client. The best way to build confidence in your work is through recommendations from existing or old clients. These can be done in a number of ways courtesy all of the social platforms available. Make someone write you a recommendation on LinkedIn or for use on your website. You can also amplify the good will of your clients by retweeting a particularly flattering tweet and integrating your social- media feeds into your blog or website. Last but not the least, don’t forget to post any constructive media coverage on your site. Giving your potential clients the confidence that they’re working with someone who’s the best and who has delivered great experiences to other people beats everything. Inbound Marketing empowers marketers to attract visitors, convert leads, close customers and delight promoters. We, at iNFOTYKE, know exactly how to use Inbound Marketing to held give an edge to your business & give it the boost to make it compete in today’s world. So if you were waiting for the perfect time to get started on boosting your business, the time has come & the right people are just a click away! You’ve got nothing to lose but a great garden to gain!